Elysian Studios and One Kiss Creations Thank You Ladies! Oh Marla, I know how excited you were about this. And now I see why...it is just so beautiful :-) The blue you used is very comforting and peaceful. And the Blue Heart is just so deep and lovely. I feel like I am whispering as I type this, like I don't want to disturb the calm. Making this was a beautiful tribute to your daughter. Thank you. Marla, your bracelet is gorgeous and it is even more special because you did it in the memory of your daughter. The person that receives your bracelet is going to be filled with joy. Oh and great job on your first self design. Thanks Therese it means a lot that you like it. I am really happy with the way that it turned out. My boss had me make his wife one after seeing it in Auburn Colors lol. So not only was it my first designs but my first commissioned sale as well. This is such a beautiful bracelet, and it sounds like a lot of love went into making it. A mother in pain will receive this, wear it, and find joy again. It is a marvelous gift you are giving. Thank you Sharyl for your kind words. I hope that it provides some comfort to a woman that needs it. 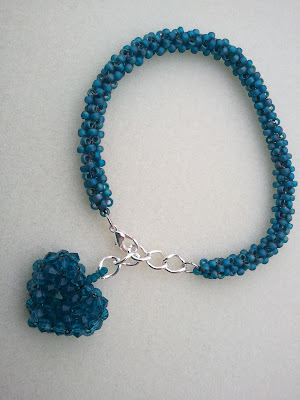 What a GREAT bracelet the color is perfect. You will make someone very pleased to wear such a beautiful bracelet and a heart no-less what LOVE! Marla, I love this bracelet. The beadwork is exquisite and the heart is such a thoughtful, personal touch. A beautiful tribute to your daughter. The recipient is a lucky woman to receive a gift as heartfelt as yours. Thank you! Like you I also used some size 8/0 beads. It was my first time using Cubic Right Angle Weave and it reminds me a lot of your piece for the hop. Great minds think a like! Beautiful that heart is really special - this will be a very special gift indeed! Thank you so much! I am glad you like it. Did you make that lovely enamel flower in your piece? I just love it! You did a great job! I too learned how to do CRAW from Heather's video. 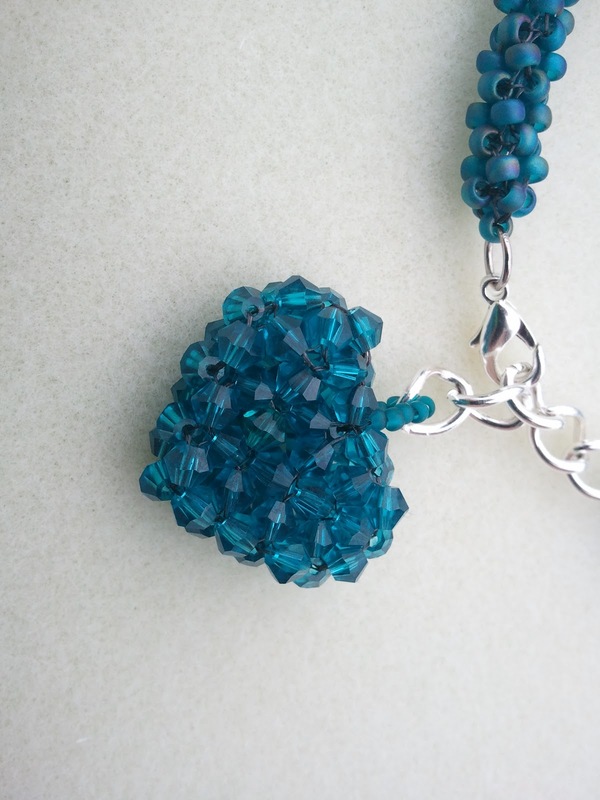 I adore the heart dangle, and I'm sure the recipient will feel well loved by your gift. Glad we got to hop together on such a special cause. Thanks Shirley! Wasn't Heather's video just so super easy to follow! Your piece is super lovely as well :) Nice to meet you! Whoa, talk about having your heart in your work, beautiful! Thanks Mary! I like your pieces for the hop as well! The Denim piece is stunning! Wow! This has caused my jaw to drop! It is beautiful. The heart - wow. Just precious! Oh, Marla, I am so glad you joined us, and I am so, so sorry about the loss of your daughter. I cannot even imagine. Thank you for sharing your story and your talent with us, and joining this hop (first one! Yea!!). Your piece is just gorgeous, and will be treasured. Much love to you, Marla! Wow, Marla - stunning. The heart is simply awesome - and I am sorry for your loss... but this is the most beautiful tribute. Talk about wearing your heart on your sleeve! First...I am so sorry for your loss...I have no words. But, your bracelet is one of the most beautiful that i have seen today - and I have seen alot! Your technique....just awesome and lovely! Thank you Patti! I really loved your contributions as well. That blue freshwater pearl bracelet that you made is stunning! Thanks so much for visiting. Stunning work Marla, and a beautiful tribute for your daughter!! Big Hugs!!! This bracelet is a beautiful tribute to your daughter. I know that whoever receives it will feel all of the love that was stitched into it , bead by bead. Thanks Terry! It was stitched in love and a bit bittersweet as well. Thanks so much for visiting! I love, love, love the color you used for this design. As well, the bracelet itself is just heavenly. It's sure to be worn with the knowledge that much thought and love was put into it. Well done. Oh how pretty! That heart is just so darn sweet! What a beautiful tribute to your daughter. The heart is very lovely! I hope this comment makes it, I've been having a bit of trouble on some but I really want to tell you how gorgeous this bracelet is! Truly awesome! Thank you very much! It means a lot! What a beautiful tribute! This bracelet is so lovely - I am in love with the beading and the heart is just amazing!! Thanks Shel! I am new to Cubic Right Angle Weave and I just love it. It is my new favorite weave. Love the "heart on a string" sentiment! It's a beautiful bracelet and I'm sure the recipient will love it! Thank you Michelle. Wearing my heart on a string just seemed perfect for it as a name. I am glad you like it! So sorry for the late response, but was having trouble posting while traveling in New Zealand the past few weeks. I LOVE this bracelet! I think it my favorite so far from the hop. Some lucky lady will be thrilled to get this one!